To better understand her home country, Akiko earned a degree in Contemporary Japanese Culture. Afterward, she worked for 8 years at a Japanese technology company as a software development supporter, business developer and project leader in charge of creating a subsidiary in Thailand. By leveraging her unique cultural background and experience in business, Akiko hopes to further open up Japan to the West by helping small Japanese companies expand their business overseas. “I want to bridge different people and entities through business,” Akiko says. 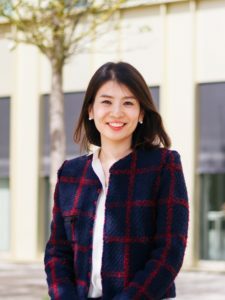 Just before she graduated, we caught up with Akiko to find out more about her unique story and how the MBA has helped her achieve her goals. Whatever stereotypes there are for Japanese women – you break them. Is that intentional? I take that as a compliment! I had a difficult time after coming back from Cambridge. In Japan, there is the idea that we need to be homogenous, and there are so many unstated rules that we need to follow. It took me 10 years to be able to position myself in Japan as someone who is Japanese but is still quite different. Why did you decide to do an MBA after working for 8 years? I wanted a clear idea of how to lead business development. Where I was working we couldn’t create real new business, because neither my company nor I knew how to do it. I wanted to gain the skills and knowledge that I was lacking, and I wanted to study in Europe, so I asked my company to sponsor my MBA. Tell us about the Digital Marketing Seminar that you organized during your MBA. Many of my peers in the January 2017 intake wanted to gain deeper knowledge about Digital Marketing, and because I was an Academic Representative, I decided to organize the event myself. I invited four guest speakers. Even though it was on a Saturday and we charged 20 euros per ticket, the tickets sold out and we had people requesting extra seats. The students really enjoyed getting a big picture of how digital transformation works. Do you have a class or a teacher that really impressed you? Gonçalo Pacheco de Almeida, who leads the strategy specialization. He taught us two things: how to think strategically, and how to negotiate. His course was very interesting to me because in Japan we think negotiating – especially financial negotiation – is bad. It means that you are greedy. People try not to be too aggressive, and they avoid negotiation to avoid conflict. This is very different from the European or the American way. In order to achieve my goal to connect Japanese companies with foreign companies, I needed to have this skill. A year ago I didn’t speak about what I wanted to do in the long-term, but now I feel more confident talking about the future. I want to motivate small and medium-sized Japanese companies to expand their businesses overseas so that more people can be exposed to different cultures. The great thing about the MBA is that I’ve met peers that I could potentially work with in the future. Not only am I more confident that I can negotiate when necessary, but I know that I can use the HEC Paris network to find people to partner with in my future endeavors. What was your most unforgettable experience at the MBA? When I first arrived I was very shy, and I wasn’t sure how I could contribute because I did not have any marketing skills or a background in finance. I wanted to give something back, so I pushed myself to become an academic rep during Core 1 and Core 2 courses. It helped me to learn how to communicate with different people, believe in myself, and to do what I think is correct. Now I can ask people to do something for me if I think it’s the right thing, and if it will benefit people on the whole. Even though I didn’t feel that I was a strong leader, many of my talented peers praised me as a good leader because I did what I said I would. Thanks to this, I earned a leadership award given at graduation. Akiko is now working for Accenture in Tokyo as a strategy consultant, where she hopes to help Japanese companies develop their businesses and expand overseas.